The Wells Heritage Walk is a partnership between the District of Wells and the Wells Historical Society. The goal of the project is to create a walking tour of Wells, leading visitors through the town to explore the heritage of Wells through interpretive panels and a guided pamphlet. Saanich’s heritage designated Municipal Hall turns 50 in 2015. To celebrate the building's 50 years of existence, the District of Saanich is planning to install a commemorative sign and host a celebration of the building. The sign, designed to incorporate unique design elements of the building, will be prominently located outside the entrance to the Hall and provide a historical account of the building and its significance in the community. The celebration will include walking tours of the building and grounds, a reenactment of the original Council meeting and a self-guided walking tour brochure document the building's unique architectural features. Heritage Vancouver Society will be producing a series of website articles with photos, graphics and videos to raise awareness for specific heritage resources in Vancouver. This approach takes serious and complex heritage issues and thought and makes them accessible to a wide audience. Areas covered will include Main Street/Mount Pleasant, Commercial Drive, Strathcona, and Chinatown neighbourhoods. This is a joint project between the ‘Namgis First Nation and the Village of Alert Bay. The project will consist of a series of ten signs spread throughout Cormorant Island that highlight places of historical significance from both pre-contact and post-contact eras. AdvantageHOPE proposes to construct a permanent, outdoor exhibit celebrating the legacy of the historic CNR Station House and raising awareness for its role in Hope, British Columbia. The exhibit will consist of a kiosk structure with space for six large interpretive panels and a seating area to promote social interaction amongst visitors. The proposed Station House Awareness Project will complement the larger Station House Revitalization Project. The revitalization project will see capital improvements to the heritage site to make it suitable for use a welcome centre, visitor centre and museum complex. This project will repair and repaint the exterior of the iconic Point Atkinson Lighthouse. The Unitarian Church of Vancouver, at 49th Avenue and Oak Street in Vancouver, is a Heritage A site on the City of Vancouver's Heritage Register. This project will replace the roofs on the church buildings. To preserve the historic barn on the Felker Homestead in 118 Mile House, the Lac La Hache Historical Society will pour concrete to support new posts and add support columns, add supports for roof overhand, and repair the metal roof of the historic barn. This project will remove and replace rotting decking at the front porch and the replacement of the lower cedar roof on the heritage building located in Duncan, BC. The Gabriola Arts Council is embarking on necessary repairs and restorations to a heritage building that was donated to it by the Gabriola Women's Institute. This project will include repairs to the foundations and exterior walls. 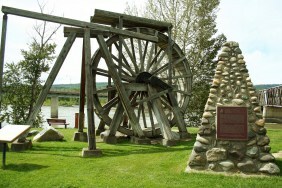 This project will restore the Cornish Waterwheel, which is a prominent landmark and symbol of the City of Quesnel. The wheel will be rebuilt reusing the core metal components. New interpretive panels will be installed. The Catalina aircraft is being restored in the water bomber format. This project will reinstall the original observation blisters on the fuselage of the aircraft. The "PBY" Catalina CF-UAW is an amphibious aircraft originally stationed at Patricia Bay in Victoria BC in the early 1940s during the Second World War. 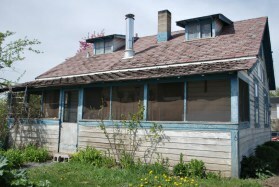 This project will replace the roof, restore windows, and paint the exterior of this 1932 heritage house in downtown Williams Lake. This project will contribute to the re-roofing of seven of the historically significant outbuildings of the Central BC Railway & Forestry Museum located in Prince George. These buildings date from the early to mid 1900s, and house the museum's artifact collection. 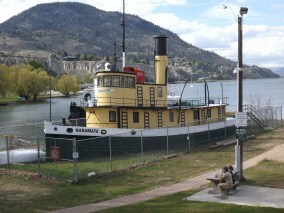 The SS Naramata is the last surviving steam tug in the interior of British Columbia. A hole in the hull is causing the ship to fill with water and deteriorate from the inside. This project will locate and repair the hole in the hull to prevent further damage and ensure the ship is protected for future generations. This project will restore the exterior of the Net Loft/Machine Shop building, and the restoration of the exterior of the Main Canning Building's Fish Loading Bay. 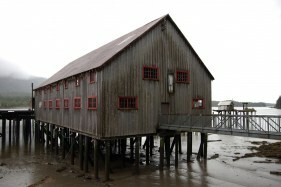 Both buildings are part of the North Pacific Cannery National Historic Site located in Port Edward. This project will repair the foundation and flashing of the former Cranbrook Central School building, currently used as the Ktunaxa Nation Government Building in Cranbrook.